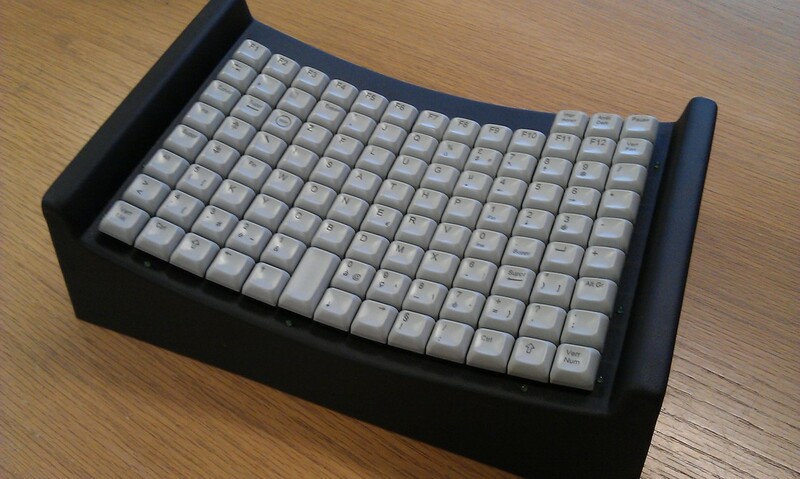 MALTRON Single finger or Head / Mouth stick keyboards have a unique shape and keyboard layout designed to minimise head or finger movement while keying. Language layouts available include Canadian-French, English UK, English US, French, German, Norwegian, Spanish and Swedish. Analysis between the Maltron layout and use of a standard Qwerty keyboard show that the ratio between Qwerty and Maltron layout is 1.5 times. This analysis has been undertaken using the Modern Prose source text and calculates the movement and distance travelled from key to key. Shifted keys (Capitals Etc.) add the additional distance required to move to the shift key before keying the shifted character. A sample of modern prose work by various authors has been analysed and shows the following graphical distribution with the letter placements on the mouth/head stick keyboard. The above chart shows the even spread of movement during writing. Note: For clarity in the QWERTY diagram below, the space key has been shown on the bottom row. As a double key it is in fact closer to the main group. The above charts show the advantage of the use of the Maltron keyboard over the use of a standard Qwerty type. You can see that on the Maltron Mouth / Head stick FoU layout, activity is reduced to the central group of keys. Although the ratio of 1.5 times for a Qwerty keyboard may not seem much at first glance, as the figures show this adds up to a significant difference over time. Additionally the amount of side to side movement is greatly reduced and more balanced with up and down movement. This is significant in reducing strain on the head, neck and upper body muscles. Additional advantages of the Maltron Keyboard become apparent when you consider other forms of input, such as numerical data. The close proximity of the number pad area allows their easy use. Conversely on a standard Qwerty keyboard the number pad area is a significant distance from the main group of keys and may in fact be unusable.